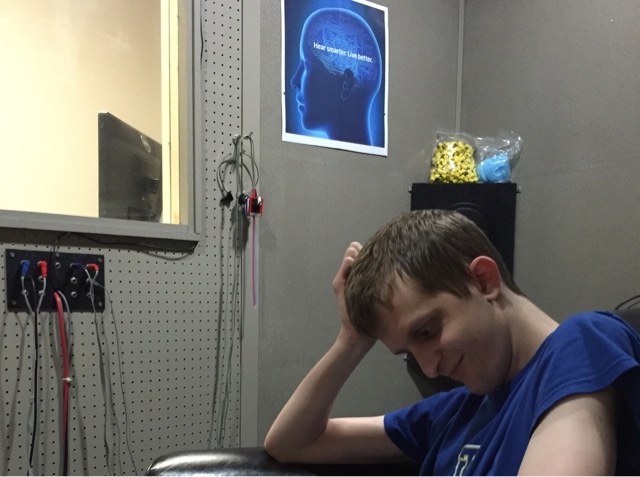 Robbie was in the sound proof room while they tested and re-tested his hearing using various methods. They have very sweet audiologists at Hearts for Hearing. They agree with our ENT that he needs hearing aids. They recommend Resound, which will work with his phone too. Robbie likes the blue ones. They should also help with the ringing in his ears. They can be programmed to play white noise to help with the ringing. Our next step is to meet with Oklahoma Rehab in a couple weeks to see if they will help with the some of the cost and then put together a plan to buy them for him. Jim needs hearing aids too, but is waiting for Robbie first.